L. Coelius was one of the moneyers for the year 189-180 BC. He laterserved as Legatus in 170-169. Gens Caelia, also written Coelia was a plebeian family at Rome. 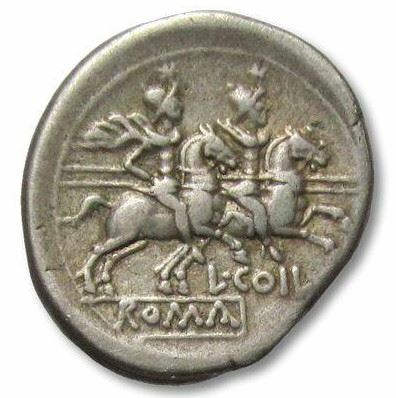 The nomen is usually written Caelius in manuscripts, while Coelius or Coilius is regularly found on coins. The name is frequently confused with the more common Caecilius. Although the Caelii asserted their great antiquity, the first of this gens who obtained the consulship was Gaius Caelius Caldus in 94 BC. The Caelii claimed descent from the Etruscan hero, Caelius Vibenna, whose adventures were legendary in Etruria, but largely forgotten at Rome; the emperor Claudius, who was deeply interested in Etruscan culture, described the adventures of Caelius, his brother, Aulus Vibenna, and their companion, Macstarna, whom Claudius maintained was the same person as Servius Tullius, the sixth King of Rome. The famous François Tomb discovered at Vulci includes a fresco depicting one such episode, in which, aided by a companion, the three heroes and their friends escape from captivity, and slay an enemy named Gnaeus Tarquinius of Rome.